The Estuary Working Group was initiated as a sub-committee by Project Watershed following the “Heart of the Watershed” Symposium on Restoring the Courtenay River Estuary held in October, 2008. We are made up of 11 member organisations and individuals dedicated to protecting, conserving and restoring the diverse, productive and highly cherished K’omoks Estuary (name changed from the Courtenay River Estuary in January 2013). To protect and restore the K’omoks Estuary. • To collaborate with local governments to establish an integrated governance system and a plan for protecting and restoring the estuary. • To establish monitoring projects to gather baseline information on the state of the estuary. This data will be used to determine what needs to be done to restore the health of the estuary. • To initiate restoration projects. • To document past human activity in the estuary. • To Increase public knowledge about estuary issues, health, restoration, and protection through public forums and the dissemination of information. • To increase public participation in estuary issues, health, restoration, and protection through involvement in monitoring and restoration projects and educational opportunities. We meet every 2nd Friday to discuss, plan and implement projects aimed at restoration and protection. So far we have created a vision, made some maps and initiated a few projects. Check it out and get involved! 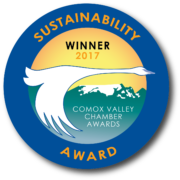 In October of 2008, Comox Valley Project Watershed Society sponsored a major symposium on the Courtenay River Estuary. From January until September 2009, an estuary working group consisting of individuals from government and environmental groups as well as independent professionals worked on preparing a vision document to help direct the future of the estuary. To guide our vision, we chose a traditional aboriginal principle — Keeping it Living. The complete Keeping it Living document can be found by clicking HERE. The document suggests that one management body with representation from all four governments, experts in the field, and selected local environmental organizations should have responsibility for determining and guiding development and restoration efforts along the shoreline and within the waters of the estuary. Keeping it Living envisions residents living within the estuary and surrounding area in harmony with the natural life cycles occurring within the estuary and its watersheds. Protecting and restoring the estuary requires the co-operation of local governments. It requires the voice and passion of all citizens, in our schools, in the workforce, and those who are retired who live in this beautiful Valley. It needs the support of our environmental organizations. It needs the voice and wisdom of K’ómoks First Nation’s teachers and elders. It needs all of us to speak for and on behalf of life as it occurs within our estuary. The Estuary Working Group and Project Watershed invite all to read the vision document and to become more aware of and involved in the preservation and restoration of this beautiful natural feature of our Valley.